That’s a real brief synopsis, and I’ll add details through other posts later. For the time being, here’s a post on a little section of the Kern River in Kernville, Calif. called Chamise Gorge. I spent most of my weekends in Kernville boating while working for Canoe & Kayak. Somehow Orange County didn’t appeal to me. The Kern River did so I spent every Friday driving/carpooling the 3.5 hours to Kernville to boat for the weekend, and it suited me just fine. The Kern River itself is 164 miles (264 km) long, and most all of it can be run. The river splits to what’s above Kernville and Lake Isabella and what’s below, which usually runs late in the summer after the upper becomes too low. It runs through the Southern Sierras, which are unlike anything I had ever seen in my few years as a traveler. Steep granite walls and smooth, big boulders form some really fun boulder garden, big water runs. People come from all over California to paddle sections of this river, and I can see why. The biggest shock to me paddling the Kern is just how cold the water is. Like for real, it’s brain-freeze-from-the-outside, two-three warm layers in the summer, damn-it’s-so-cold, cold. It’s snowmelt so what did I expect? Well, not that. Us southern boaters better realize how lucky we have it. I was lucky enough to meet and become friends with basically the ambassadors of the Kern River, Brett and Liz. Brett paddles about 200+ days a year, a lot of it on the Kern, and Liz plays like an otter in the river. They knew almost every single spot on the upper Kern, from sneak lines to hero lines, where to practice attainments and where the best surf spots were, even little fun spots on the river that almost no one else knew. They had the Chamise section down. Chamise is a 3-mile Class III section of granite whitewater fun. It’s also the section that can be run at the lowest level, down as low as 160 cfs (though some would disagree that level’s runnable) when the rest of the Kern has long since dried up because of a bad drought in SoCal. So I got pretty familiar with it as well. At least at low level, the rapids are pretty much read and run with a couple simple moves and a pool at the bottom. Regardless of flow, Chamise is a pretty dynamic little section. You’ve got drops, S-Turns, and slot moves. A couple waves and a nice play hole also add to the fun. Almost the whole section is roadside should anything happen or even just for good photo opportunities. Paddlers enjoy this run in a creekboat, but really it’s a playboat run. It takes about 20 minutes to get to the put-in from Kernville. From Kernville you hang a left onto Sierra Way and drive straight as it becomes Mountain Highway 99. You’ll come to the turnout on the right with a sign for the “Salmon Creek Falls.” Park in the turnout. Drive 2.1 miles farther up M-99 and enter the camp zone on the left across from the forest service sign. Park at the camp, which is where the put-in is. 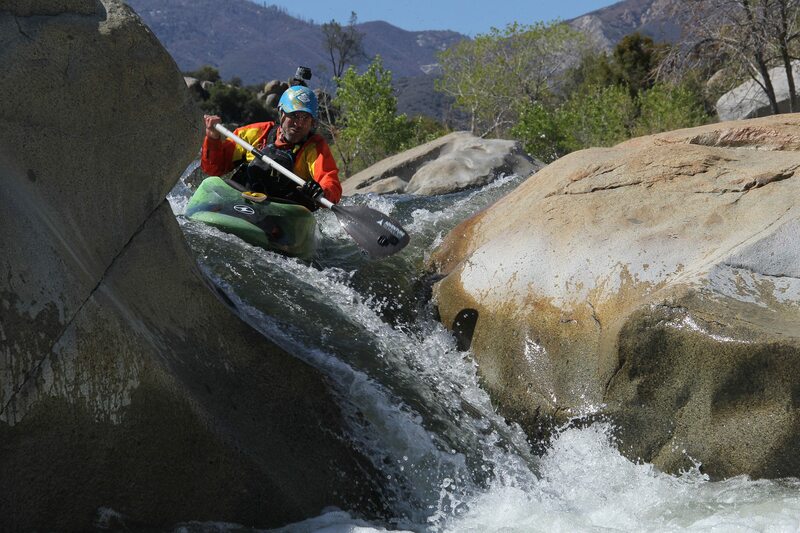 Chamise is a great, quick introduction to Kern River whitewater. If you are ever driving to Orange County or anywhere in SoCal be sure to stop in Kernville. It’s a cute little town surrounded by mountains, great climbing and mountain biking, fly fishing and paddling. You can even end the day with a local brewery run by former slalom Olympians. All around, Kernville is worth a visit.